God is leading you to minister in a certain way. Jesus' life was about ministering to the lost. But ministering to others takes commitment and time. How do we go about conducting ministry in a way that produces disciples of Christ? 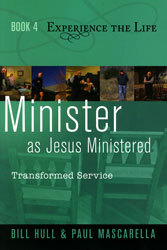 To minister as Jesus ministered is to serve with the supernatural freedom of self-sacrifice, giving ourselves for others. Also available for each study is its corresponding leader's guide and DVD that includes six fifteen-minute presentations by Bill Hull.